If you need flooring removed, whether in a residence or commercial building, you want to know you’ve hired the right company. But, how do you know that you’ve chosen the best floor removal company for the job at hand? There are a few things you can consider before choosing the floor removal company that best suits all of your needs. Undoubtedly, the investment you’re planning to make into the flooring of your home or industrial building should be handled with care. By choosing a floor removal company with the right experience, you’re placing that investment into hands you can trust. Here at Dustbusters, our founders, Todd Poindexter and Ed McKenna, have over 35 years of industry experience. With histories in licensed contracting and renovations, together the two have come up with a system and experience which meets the needs of flooring projects of all kinds. Preparations: We know that your home or business is more than just your flooring. 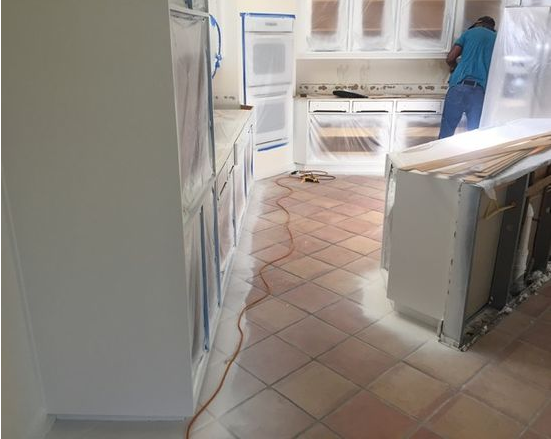 So, while we remove your flooring, cabinets, furniture, and other items need to be protected. Before we begin the removal process, our team works diligently to cover and move items which may otherwise be damaged throughout demolition. Dust-Free System: During demolition, we utilize specific equipment which reduces the amount of dust released into the air of your home or industrial building. Without this equipment, electronics, a.c. units and even your health can become compromised from large amounts of dust released into the air. Furthermore, it saves you from future cleaning after demolition. Demolition Hauling: The removing of flooring provides lots of trash which need to be hauled to a trash processing facility. Most neighborhood garbage systems won’t pick up large amounts of flooring, so that’s something that you’ll have to factor into your budget. But, with Dustbusters, it’s a service which is included in our floor removal package quotes. If you think that Dustbusters is the floor removal company right for your job, give us a call today for a free quote at 866-883-8783! Whether your job is large or small, residential or commercial, we have a floor removal team which can meet your needs immediately!